PlayStation Vue this week announced a new Multi-View feature for Apple TV that allows you to view up to four channels at once. Here’s how to use it. This week PlayStation Vue announced that it was updating its Apple TV app to support a new “Multi-View” feature. Previously only available on PS4 (and only three screens), this new feature allows you to watch up to four screens at the same time. Here is a look at how to enable and navigate the new feature on your Apple TV and watch multiple channels at once. 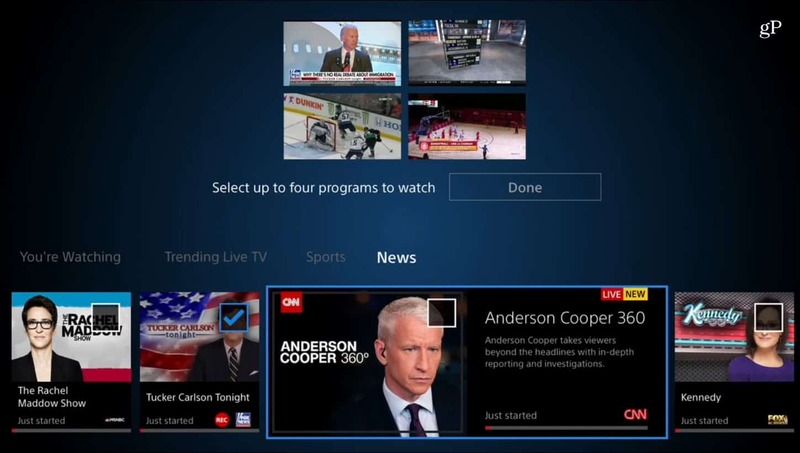 If you are a cord cutter and use PSVue, this is a welcome new feature. Launch PlayStation Vue on your Apple TV and while you’re watching a live TV program, swipe down on the Apple TV remote. There you will see a new “Multi-View” tab. 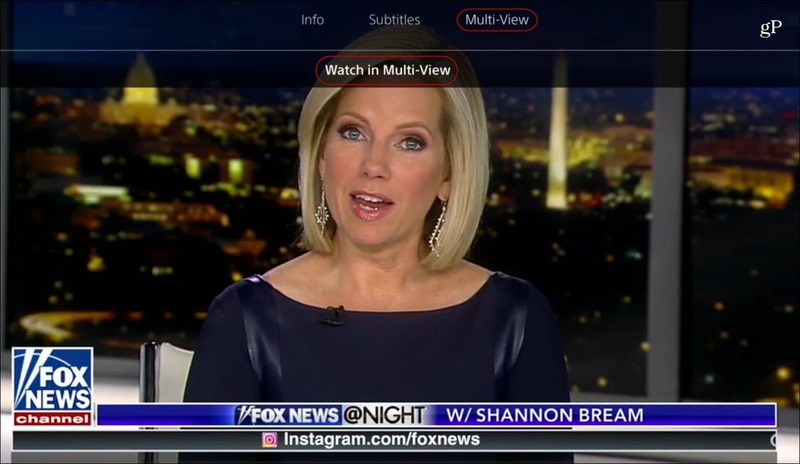 Highlight it and then select the “Watch in Multi-View” option. Note that you need to be watching live TV – it won’t work if you’re watching programs from DVR. Next, you can start selecting the other channels (up to four) that you want to add to the multi-view. 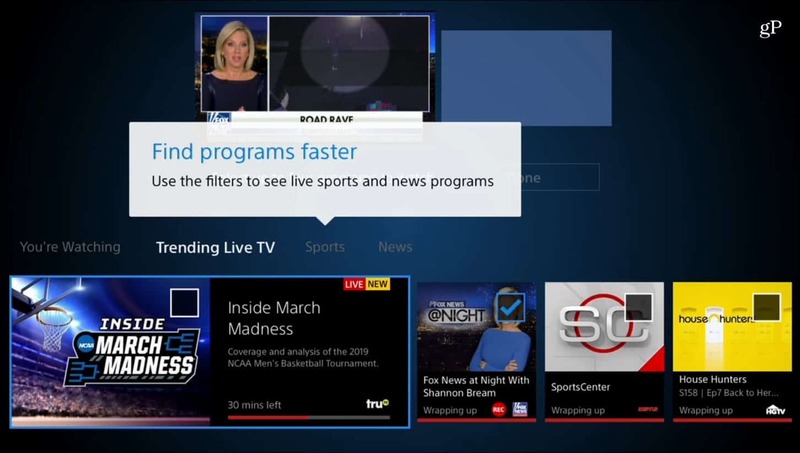 While you can choose any channel, to make things easier, it allows you to filter shows by Sports and News. This comes in handy while watching major news events or multiple sporting events. Scroll through and select the channel you want to add to the multi-view. Each channel you select will be added as a thumbnail at the top of the screen. When you’re finished choosing your channels, select the “Done” button. Once you have four screens showing, you can simply swipe over to the one you want to enlarge and select it. If you want to go back to the channels you had showing in the multi-view mode, hit the “Menu” button on your Apple TV remote. Hit the “Menu” button again to go back to the screen where you can choose filter through and select different channels. You can also click and hold the touchpad on the remote to get additional options including: “Change Program”, “Add Program”, “Remove Program”, and “Move Program”. You don’t have to choose four programs either, you can choose two or three. For example, in the shot below I choose three different channels. If you’re a PlayStation Vue subscriber and watch it on Apple TV, you will really enjoy this new feature. 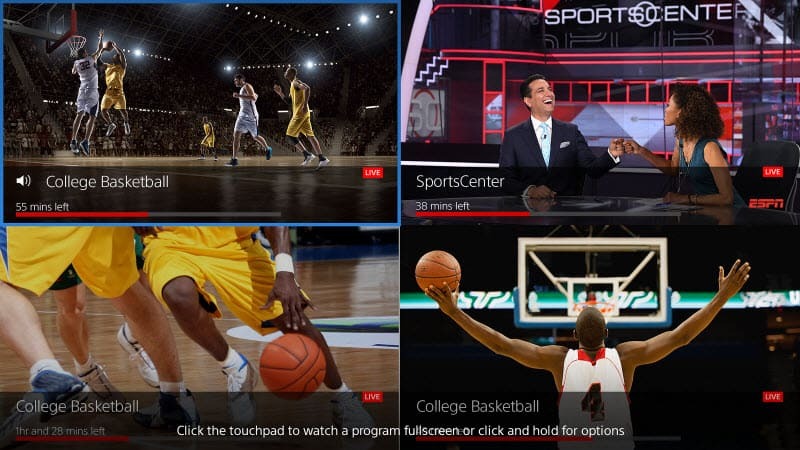 It will allow you to follow multiple games or news programs at the same time. It’s not just for new and sports either, you can use it to watch any of the channels included in your PlayStation Vue subscription. Of course, PlayStation Vue is one of several OTT live streaming TV services for people out there who have decided to cut the cord. For more on getting rid of your cable or satellite subscription, read our comprehensive Guide to Cord Cutting.